Living aboard an expedition ship never gets tiring. I don’t get stir crazy or feel trapped, even after long stretches at sea. If I need a change of scenery I step out onto the open deck and watch the shifting sea surface as waves peak, crest and fall. I savor the fresh breeze on my skin and in my hair. The scenery is always changing at sea. 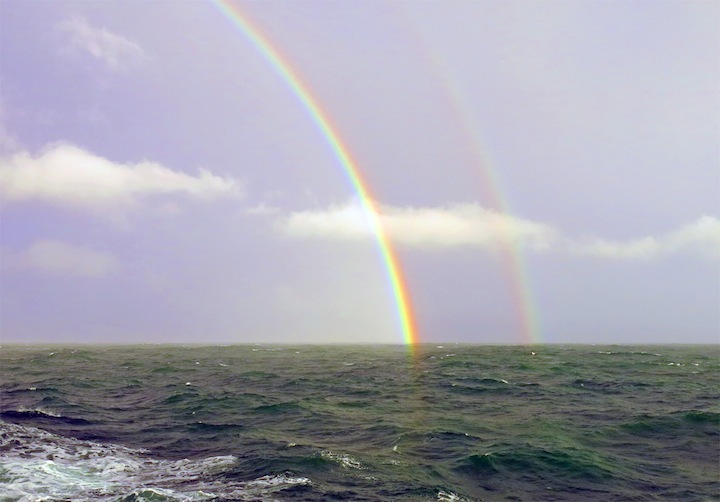 Found these rainbows off the UK coast. There is however one land-based passion that I indulge at every possible opportunity when living on the ship, and that is to RUN. When I have the chance, there is nothing as gratifying as a good run. With my headphones pumping energetic tunes, I hit the pavement and go for it. I am incognito as I truck along; looking like a local in a distant land. Really though, it’s a fantastic way to explore and I keep notes on the routes I discover. I never know what will be around the next corner, and it’s usually hard to rip myself away from the adventure of it all and turn back to the ship. So far this spring, I have been able to sneak three runs into my busy schedule. The first was along the Garonne River running right through the city of Bordeaux in southwestern France. With elegant 18th century white limestone buildings facing the streets, I set off on along the park-lined waterfront passing families strolling along, riverboats moored on the banks, and bustling shopping plazas. The highlight of that run had to be the wonderful water fountain – really a shallow manmade lake – spanning the river for a short distance. Automatic jets emit either a fine spray like sea fog over the water feature, or spurt water up in fountains that the kids run through screaming, while tourists kick off shoes and roll up pant legs to sooth their museum-fatigued feet. I finished that run in a burst of speed, pushing myself for the last half mile to the high voltage dance music in my earphones. 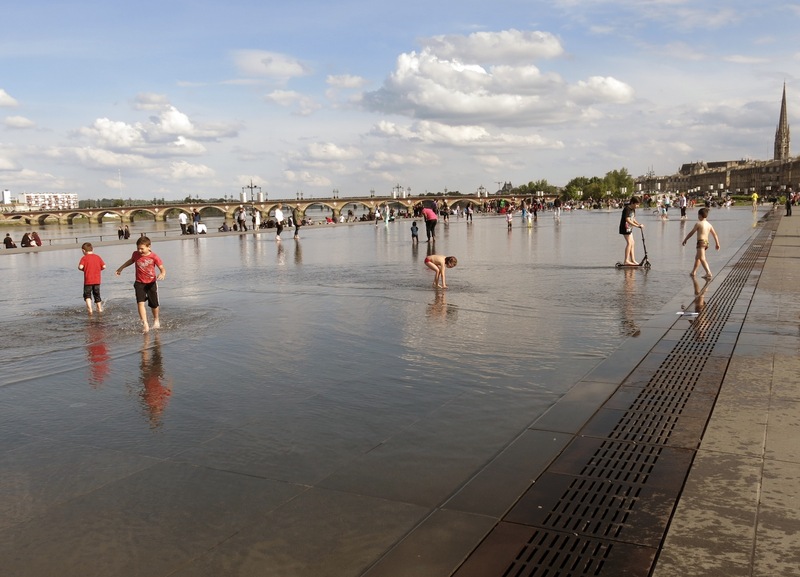 Children playing in the fountain after school along the River Garonne. The next run was a week or so later in Dun Laoghaire, Ireland – a small seaside town just outside of Dublin. I ran the length of the mile-long seawall that protects the harbor, and from up on the jetty I could see out to the Irish Sea and back into the quayside at once. It seemed the whole of suburban Dublin was out to enjoy an evening stroll on the breakwater. Teenagers walked by in gangs and gaggles, individuals walked their dogs of all varieties, and the occasional jogger exchanged a nod or smile as we passed. Dun Laoghaire Harbour. I neglected to snap a photo, so borrowed this aerial from the web. After tackling the seawall out and back I wasn’t quite ready to call it quits, so I kept running along the shore in front of the row houses, cozy restaurants and sidewalk ice cream shops. Eventually I came to a small rocky headland adjacent to a posh neighborhood and I turned left towards the water and down to the point of land. Down amongst the rocks of the point was a fantastic swimming hole. A little bit of concrete to even out rough rocky surfaces and a couple of steel ladders affixed to the rock face and presto; a perfectly sheltered cove for swimming in the sea. 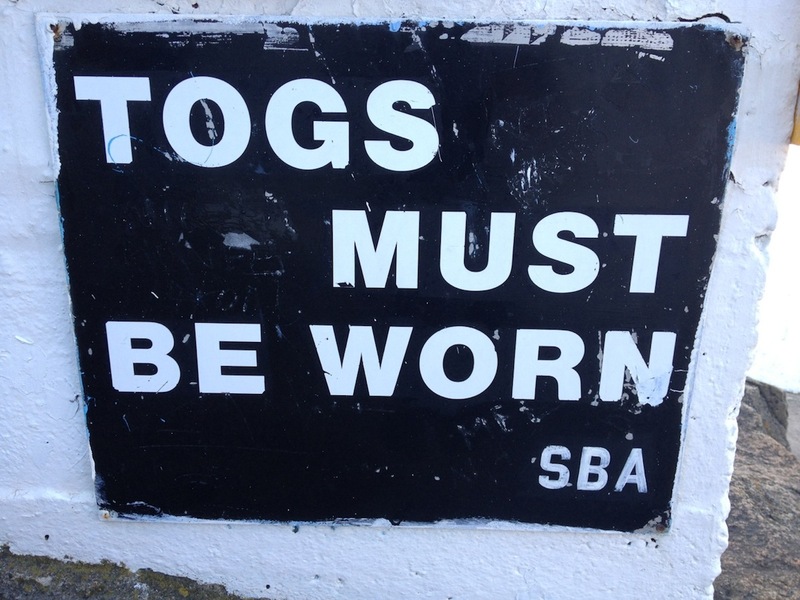 A few people were doing just that and I stopped for a minute to take it all in, laughing when I noticed the “Togs Must Be Worn” sign nearby. Clearly there’s been an issue with skinny-dipping here in the past! 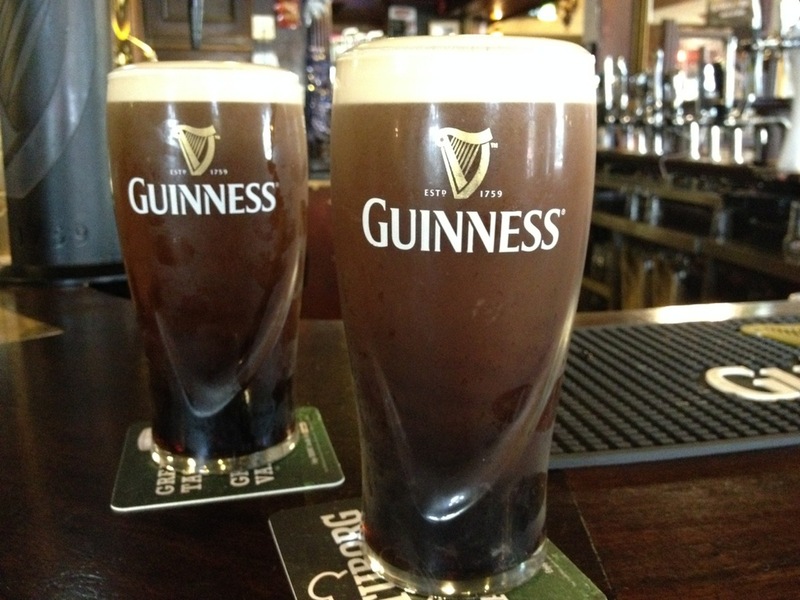 The great thing about running in Ireland is that you can treat yourself to a Guinness afterwards. Sweet as a nut! Most recently I went for a run in Oban, Scotland. It was a clear, bright day with just the right level of coolness in the air to make a run comfortable. Following the sidewalk along the waterfront I ran past the old stone hotels and guesthouses, and out into the countryside. It was surprisingly rural just outside of the town and I passed backpackers exploring castle ruins and the ubiquitous dog-walkers. To my surprise, the sidewalk kept going as well, which was a good thing given that the road is narrow and windy. I ran much longer than I meant to, purely because I wanted to see where the sidewalk ended. Turns out it’s a good 2 miles out of Oban. Finally, I had to turn around because there’s always a nagging feeling in my mind that I could miss the ship. If plans changed last minute, (as they often do thanks to an antsy pilot, or an incoming vessel needing the berth) and the gangway somehow neglected to register me as being off the ship, then there’s a real possibility I could be stranded. Just in case, I always bring a credit card, ID and cash with me when I head out. 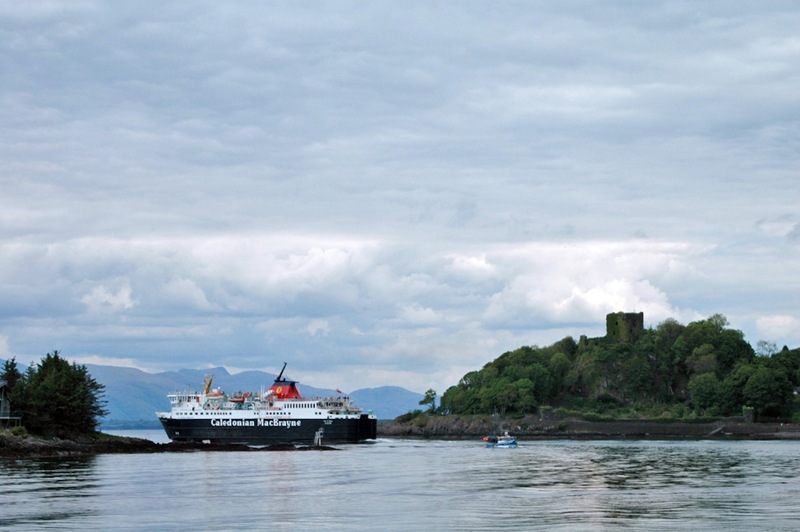 The local Cal-Mac Ferry running into Oban. Running along the coast here is spectacular. My next run may well be today in Stornoway, the capital of Scotland’s Outer Hebrides. Adjacent to the port there’s a beautiful old castle set on a massive plot of land and it’s riddled with 25 miles of wooded trails and tracks that are perfect for expedition running. Now, I just need to find the motivation to get out there…wish me luck! This entry was posted in Uncategorized and tagged Bordeaux, Dublin, Dun Laoghaire, expedition running, expedition ship, Garonne River, Guinness, Ireland, Oban, Outer Hebrides, running abroad, Scotland, Togs on May 15, 2014 by admin.